Oftentimes i like to think up new articles that will help provide good content to all my readers. In the midst of doing this i sometimes forget my own guidelines and terms of what i accept to the site. While it’s not always a perfect balance to provide positive content and good music, i would love a bit of understanding to be parted to all of you as a means to explain what Contrast CTRL is all about and maybe some ways you can enjoy my hard work even more. While those three points are but a few of the many i consider, they are the foundation of what helps me to find something for everyone. It’s sad to say not everything found on this site will be to your personal tastes or liking. That’s the beauty of being human, we all have different preferences and tastes. I however drop the ball on recognizing this and can let my personal preferences shadow what the neutrality of Contrast CTRL is all about. So while i may enjoy a artist i write about and post it to this site. Please don’t take this as my seal of approval for every song an artist may create at any given time. My focus is on the songs i have picked and what i feel could be positive points to share with all. The hardest part of creating this website and wanting to appeal to all is knowing that i cannot. So i hope everyone who takes the time to read and enjoy a song or album truly understands that you are making a choice to endorse something of your own choosing. While i may like something it’s never my intention to sell you an artist, that is their job i just merely use my writing talents to talk about music. So again, while i may enjoy what i share it’s not my intention to seal of approve or to sell you anything. What does Contrast CTRL look for when rejecting a song? Much like the three foundation points above, i look for the opposite effects of positive music. If the band or artist promotes a political or religious agenda through their music, i will turn it down and leave it for another writer out there. While i’m not perfect in doing this i have let some things slip in the past articles. As i do my best to create content for the music lover, please make a conscious choice in picking what you like and know that i do not fully endorse or want to help sell a artist. 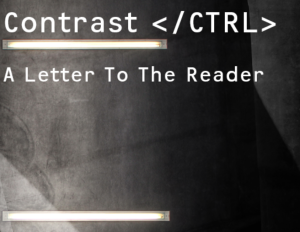 Contrast CTRL is meant to be a platform of talking about good things and not bad things. So as this site moves forward please rest assured that things will always maintain a positive spirit and that the neutral stance Contrast CTRL takes is for creating great writing freedom and music that shows the bright side of life rather than a negative standpoint. Contrast CTRL, Feature, Information, Insight, Letter, Positive Music, Thank You. Bookmark.